I’ve been asked about this a few times recently, since I am not so secretly disappointed that the community I live in is not as supportive and enthusiastic about the ideas and implications of physiological birth as I wish they were. This is a nice way of saying, I whine a lot about people choosing to birth in ways that I think are way less than optimal. We are offering our 5 week class for free for locals next month in hopes of helping shift the culture here, even if just a fraction of an inch. But I was prepping for this next round of classes (I’m always looking for ways to make it better, more current, and with better teaching methods, though I am by no means an expert!) and came across something I had pinned on my research and teaching pinterest board a while back. 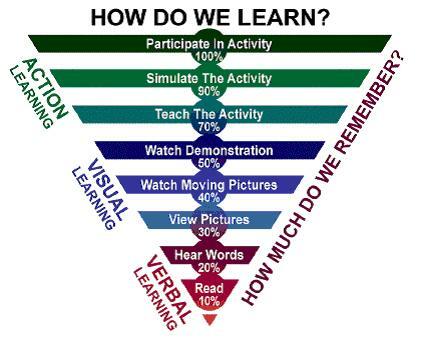 The upside down triangle shows how the different types of learning change how much we retain about what we have learned. I think it relates so well to something I say often to interested clients and curious friends – most people have never been to a birth before having their first baby, when even a few generations ago, most children would have been a part of birth in some capacity or another while growing up. As this image shows, and I think most people would agree, direct participation in an activity goes far beyond just reading about or talking about it. I think this gets to the heart of the issue for many areas where birth is becoming increasingly more medicalized in every location (home, birth center, hospital). Women aren’t directly experiencing birth until its their turn. Most of them are only having a few babies, and only have their experiences to go off of. Even seeing photos or videos (which I am still hugely passionate about creating and sharing) can only do some much as far as consciousness raising, confidence building and culture shifting go. I always tell people how blessed I feel for having been to so many births before having my first baby. I knew birth could be hard, and that I could do it, because I had seen others do it! If I hadn’t had that, I highly doubt I would have had a birth like I did. So should we be inviting everyone to our awesome births to educate them? Probably not (unless you really want someone there, then that’s great!). I do hope that having a new generation of kids who have had moms making alternative birth choices will help change things in the coming years though. I also hope that our collective birth education efforts can become more targeted and effective. I am excited about some new ideas for our classes – incorporating birth simulation, and asking the parents to teach some of the material themselves, since those are the next best things to participating in a birth. I hope the people who have had amazing physiological births continue to share their stories as often as people will listen too, since storytelling is a powerful tool (even if the triangle might disagree). I think women are learning about out of hospital births and are excited that they have a better option than a hospital experience, but don’t even realize there might be something even more optimal for them. Sally had a nice birth at the birth center in comparison to Suzy’s sort of crappy experience in the hospital. Little does Sally know, her birth would have had even less intervention at home with a traditional midwife, or she could have done it by herself if she really wanted to. I guess what I’m saying is, more mainstream non-hospital options are becoming better known, but people are stopping short of asking what OTHER birth options might exist beyond that, since they are just so relieved to have an alternative to the hospital. So what do we do? We need to name these options, teach about them passionately, have our student learn more deeply by simulating and teaching each other, have our students go out and teach OTHER people in the community, and create visual media for the community to interact with as we try to shift the birthing cultures where we live. I’ve heard “each one teach one” used a lot in regards to midwifery and birth attendants, and the obligation to take on apprentices, but I think we need to make more concerted efforts to tap into the energy clients and community members have, and ask them to do the same!